What better way to kick off the summer season, than to spend Memorial Day in Gulf Shores, Alabama. Alabama's Gulf Shore is packed with fun things to do. Sail the Gulf of Mexico aboard a dolphin cruise, go zip-lining, or visit Alabama Gulf Coast Zoo. You can also just plan a day at the beach and dig your toes in the sand. Spending this Memorial Day in Gulf Shores, Alabama is sure to keep you busy with entertainment! 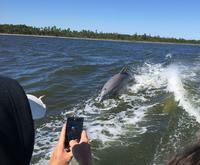 Take part in an educational, as well as relaxing Dolphin and Dinner Cruise. This Cruise offers a peak at the native bottled-nosed Dolphins, along with other wildlife. Gulf Adventure Center at Gulf State Park offers you the exhilarating thrill of zip-lining. There are a total of six zip-lines, all of them over the crystal blue waters of Lake Shelby. Take a stroll through Alabama Coast Zoo and view over 500 animals, including wolves, tigers, bears, primates, and more! Be sure to take a scenic hike along the Hugh S. Branyon Country Trail, which winds through Orange Beach, ending up at Gulf State Park. As the hours tick away on your Memorial Day in Gulf Shores, Alabama, don't forget to learn about some of its rich history. The Mobile Bay Civil War Trail stretches 90 miles from the Gulf of Mexico to Mobile County. Take a look into what marines and soldiers did at every stop along the way. Explore the culture and over 300 years of Mobile history at the Museum of Mobile, AL. Visit the 375,000 square foot National Museum of Naval Aviation, but certainly don't forget to spend Memorial Day in Gulf Shores, AL.